I have acquired eggs of several more Acronicta species from a collector, and a few have started to hatch. The above video is a first instar Acronicta afflicta attempting to get at an oak leaf. I guess I’m jumping ahead of myself though, here are the eggs! 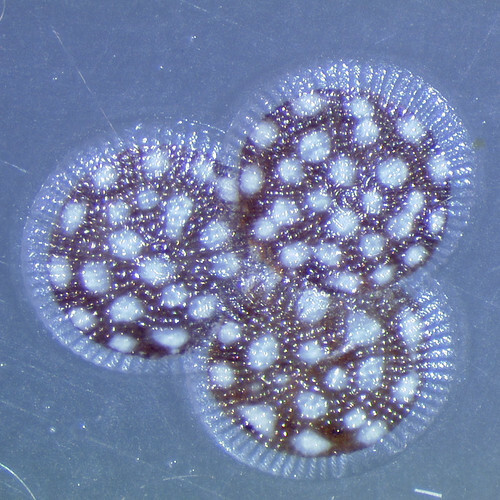 They look very much like the eggs of A. americana and A. oblinita, but with much rounder, more regular white spots. 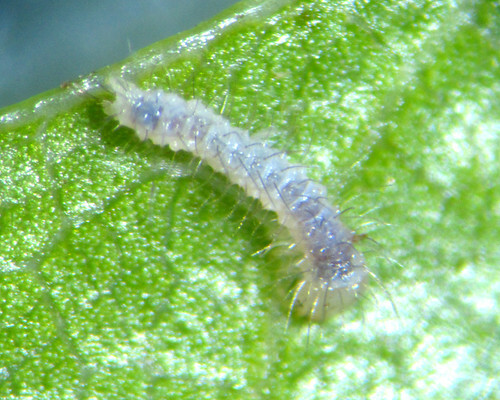 The first instar larvae look most like A. americana, being very pale and almost purple-ish. Perhaps these characters point toward evolutionary relationships? I would think so… I’m certainly getting inspired to get going on constructing the phylogeny of this group. There are many more eggs waiting… I’d say maybe 100 or more? I’ll be in the lab periodically over the weekend to check on them. Posted on May 29, 2011, in Acronicta, Noctuidae. Bookmark the permalink. 3 Comments. Again, what wonderful images and video… I’m watching for updates every day. I can’t wait to watch your caterpillars go through some of those dramatic later instar transformations that Acronicta are famous for (at least in my head). Any caterpillars you’d be willing to send my way would be great! Since I’m just getting started, I want to get my hands on as many species as I can to see what inspires me. The full transition from egg to adult will be important for some species, but not all… in order to do phylogenetic studies I’m adding to our collection of pickled caterpillars, and any instar(s) would be helpful for that.